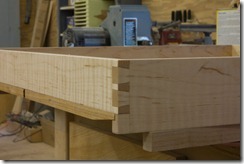 On Chiefwoodworker’s Blog I posted an article on The Design & Construction of a Traditional Drawer. 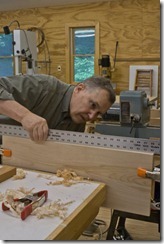 This is a companion article which describes the crafting of a traditional drawer. 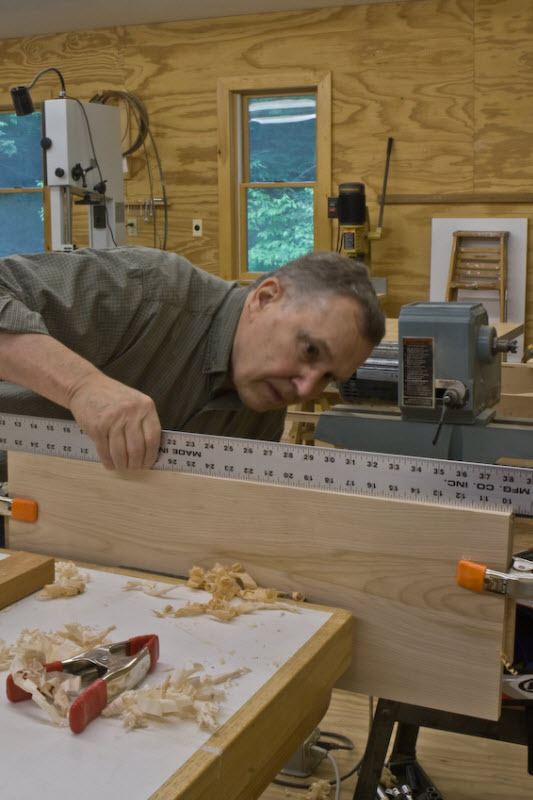 If you have not read The Design & Construction of a Traditional Drawer you may want to do so before delving into this article. 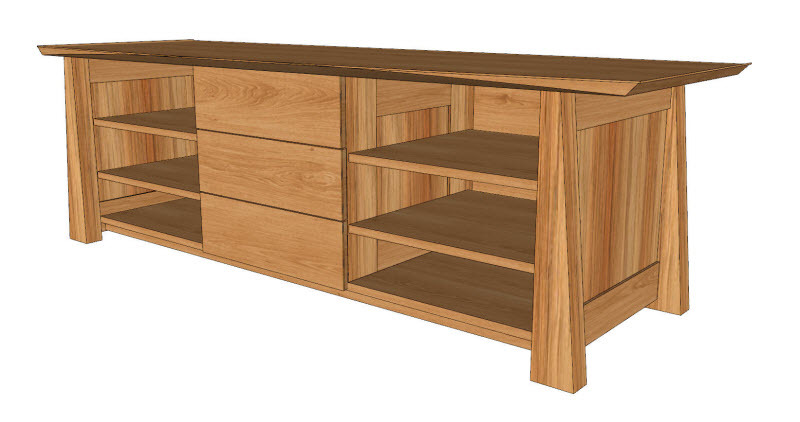 The drawer I discuss here is for an Office Table I am currently building, not the Bedside Table I used in the previous article. But the techniques are the same. I’ll start with the bottom. This office table’s drawer is rather wide, deep and shallow. The bottom of the drawer is almost 24" square. 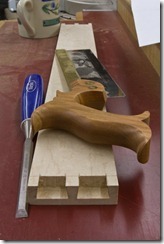 If I used a three piece glue-up to construct it, each piece would be a minimum of 8". 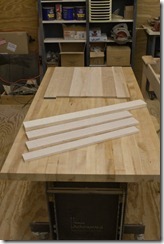 Since my jointer is only 8" I decided on a six piece glue-up, each piece approximately 4 1/2". 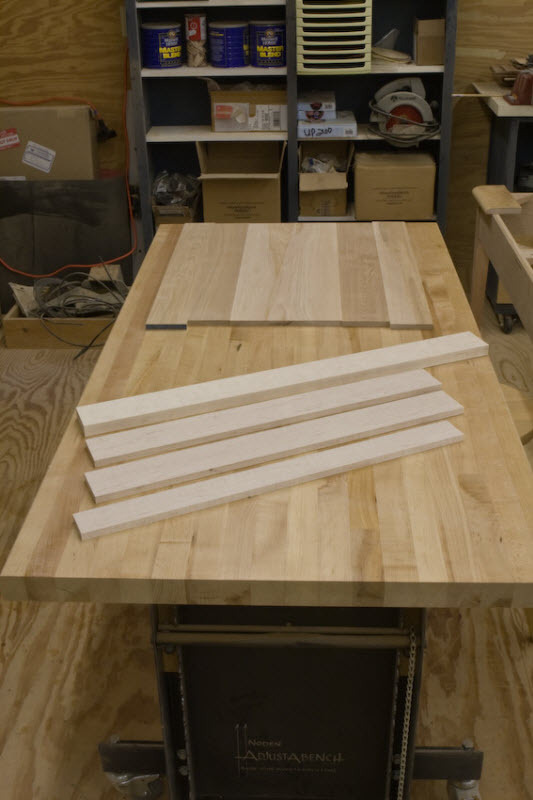 I first glued up three pairs of two boards to get three pieces approximately 9" wide. The picture at right shows these three pairs sitting side by side. If you look closely (click to enlarge the picture) you can see these pairs are not yet joined. I like to mark triangles with a carpenter’s crayon to remind me how I plan to join boards. 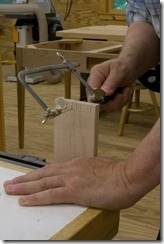 Before applying glue and clamps, the edges have first to be prepared. Four conditions are important to achieve a joint stronger than the surrounding stock. First the edges must be recently jointed or planed so that surface oils from the wood, or dirt from the environment, are removed. Second, the edges must be in the same plane, i.e. coplanar. That means that each edge must meet the other at all points of their respective surfaces. This doesn’t require that both edges are square, but they should be very close. Third, you must use the appropriate glue and maintain the appropriate temperature for curing. The fourth condition is to apply the appropriate clamp pressure. To understand this condition I refer you to Fine Woodworking, Issue Number 194 where you can read an article titled Get Serious About Clamping on page 37. To assure condition three is met I use Titebond Original for most applications; Extend when I need more time, or Type III when moisture is an issue. My shop is heated so temperature is always well within the curing range. To assure condition one I plane my edges just prior to glue-up. 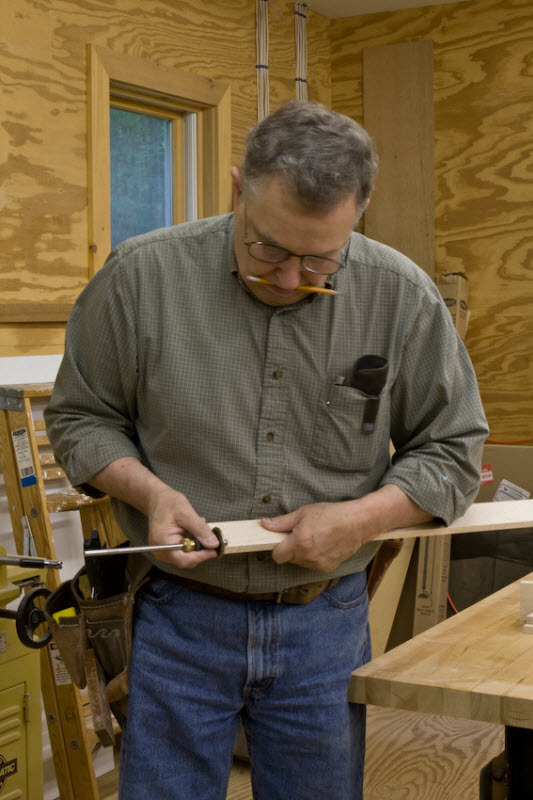 I never rely on recently sawed or joined edges. 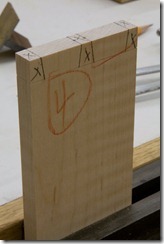 In my opinion the best joint requires planed edges. Edges planed just prior to glue-up plays right into assuring condition two, that is, to be sure both edges are coplanar. To do this I mark boards to be joined as shown above right. 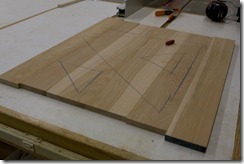 Then I fold two boards together, the two that form the joint, such that the marked sides are facing each other. I align the edges as best I can and clamp them together. Next I put the sandwich in a vice and plane the pair of edges that are to be joined as shown at left. 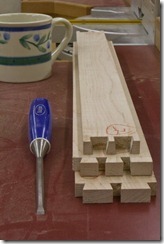 It is possible that, if not careful, the edges will be planed slightly out of square. But that will not matter if they were folded correctly. 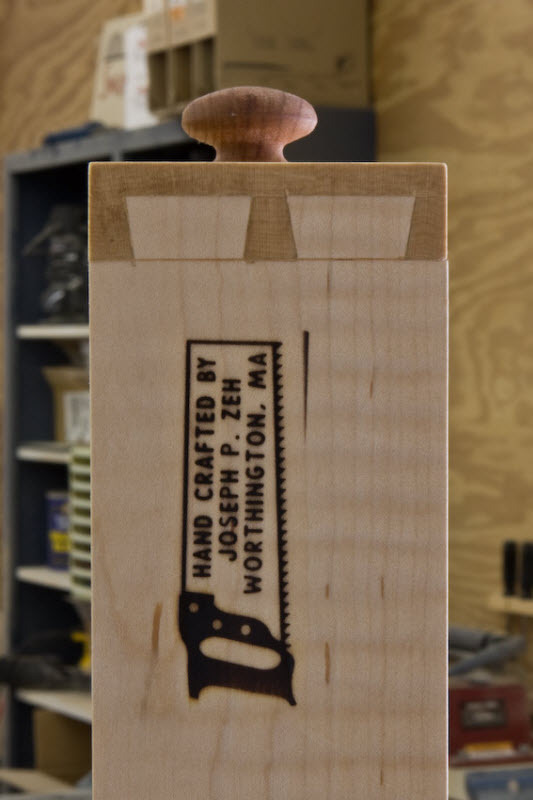 It is akin to a board that is ripped along its length with the table saw blade set a little off ninety degrees. If you put that joint back together with the edges joined as they were cut there will be no gaps. The same is true when you fold and plane. The edges do have to be straight, or flat. 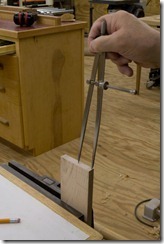 Shown right above I check the for flatness using a straight edge. After all joints are treated the same way I can apply glue, bring the panel together according to my markings, and apply clamping pressure. The final panel is shown at left, waiting for the glue to cure. The manufacturer says that glued pieces can be worked after just one hour of curing. I always let them sit overnight because I don’t want to risk stressing which may weaken the joint. 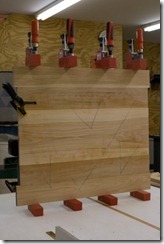 A few additional comments about glue-ups. I don’t use biscuits. I don’t believe they add strength, in fact may reduce joint strength. I have never been able to achieve alignment as well with biscuits as I can by carefully hand aligning and tightening the clamps. 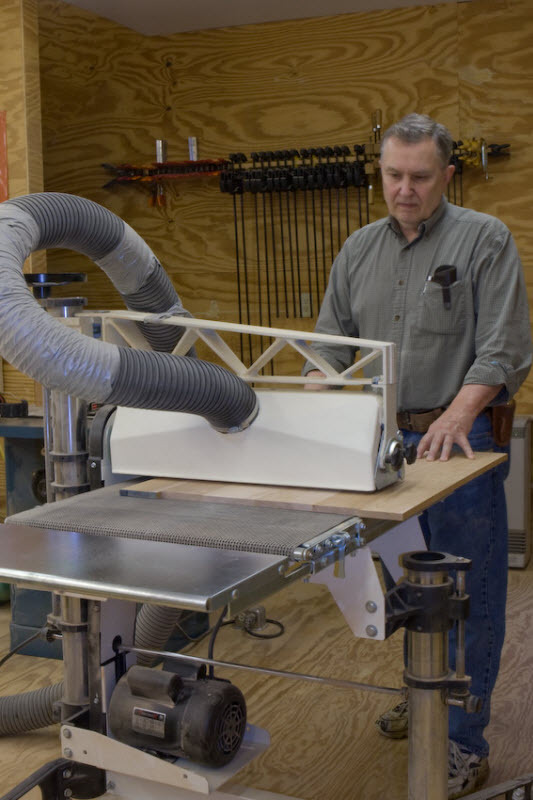 But I also leave my stock 1/16" to 1/8" thicker than final, and use my PerformaxPro 22 – 44 Drum Sander to bring the glue-up to final thickness as shown at right. 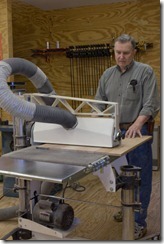 Notice that the panel hangs over the side of the drum sander, about 2" in this case. I can flip the panel on alternate passes, effectively providing capacity for a 44" panel. This comes in handy, especially for wide panels and figured woods. A traditional planer often will leave figured stock with tear outs. Not the drum sander. This machine is worth its weight in gold. When I have completed milling all drawer pieces to size I have five parts; a back, two sides, front and bottom as shown left. The next step is to mark the back, sides and front for dovetailing. I start by marking the ends with the thickness of the mating parts. The back and sides are 1/2". The front is 3/4" thick. However, the tails that will mate with it are blind tails and therefore only set in 1/2". 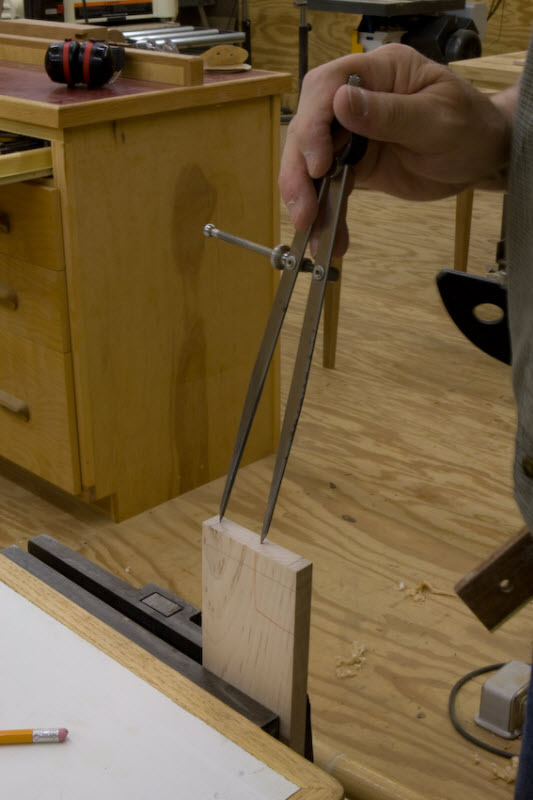 This allows me to set the marking gauge to 1/2" and leave it that way for the marking of all pieces. Shown right I am marking the end of a side. 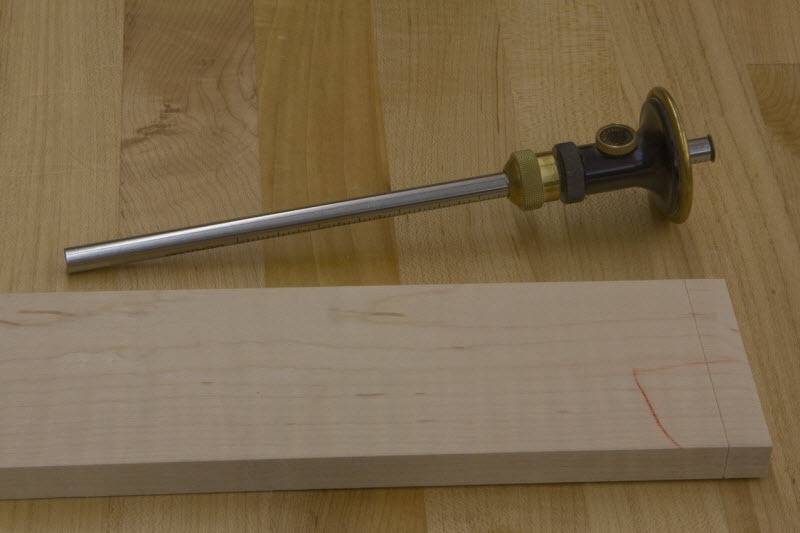 By the way, here is a tip about setting the marking gauge. Once you set it, leave it set until after glue-up. You will be surprised how often you put the gauge away only to discover you missed one mark up. Then you have to match the original setting risking a slightly different setting. 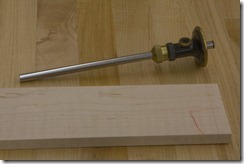 The marking gauge I use has a round blade that is beveled toward the depth gauge side. This tends to force the depth gauge tight to the board and produces a clean straight mark. In addition, the mark is cut across the grain and is deep enough to provide a guide for chiseling as will be seen later. A close up of the gauge and its resultant mark can be seen below left. Next I mark the tails. 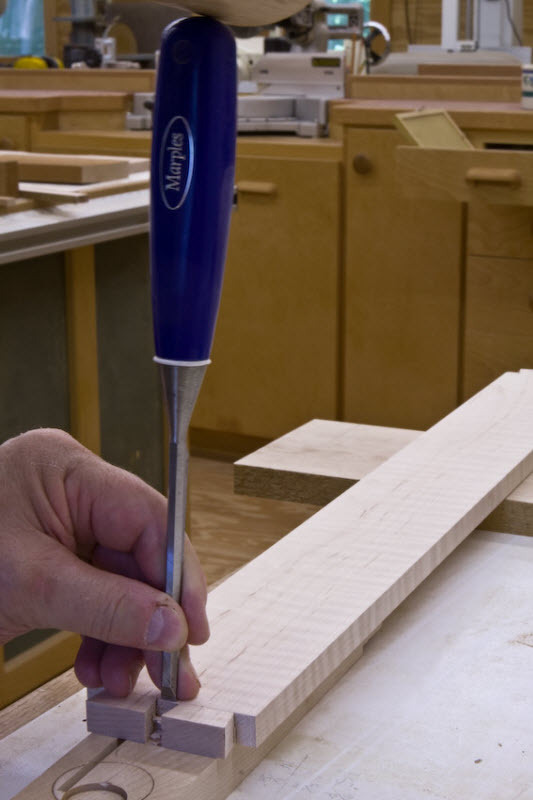 There is a lot written and debated about whether to mark tails or pins first. You can read all this material and join in the debate, but in the end all that matters is what works best for you. I am a tails first guy. Don’t ask me to justify it with facts or reason. I just prefer it. With a pencil I mark off a half pin on each end of the side’s end. Enlarge the picture at right to see the two half pin lines 1/4" in from each end. Next, I use a divider and through trial & adjustment I set it such that when I gently step it across the board (leaving no marks), starting at a half pin mark, it ends even with the other edge, shown at left below. In this case, because the drawer is so shallow, it only takes one step. If the drawer were wider I would decide how many tails I wanted and adjust the divider such that the last step still ended at the edge. The divider setting that satisfies this condition turns out to be the width of one tail and one pin. After I have the divider properly adjusted I again walk it across the board but this time apply pressure to mark the board. I must walk it from both half pin marks to complete the marking. 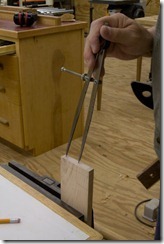 Using a dovetail marking tool (not shown) I complete the marking shown right. Notice the two small holes created by the divider. I can place my pencil in these holes, slide the dovetail marking tool up against it and draw lines across and down the side. I am careful to stop the vertical line at the horizontal mark left by the marking gauge. If I am sloppy and extend this line beyond the horizontal mark I am apt to follow it with the saw. Note I mark the waste areas with an X. 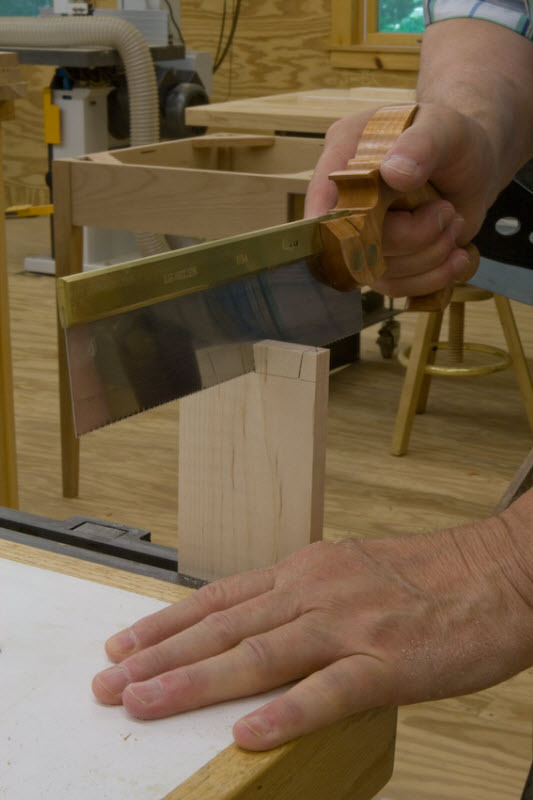 No matter how accomplished one gets cutting dovetails this step should never be eliminated. It is too easy to cut away the wrong piece if not reminded by these marks. 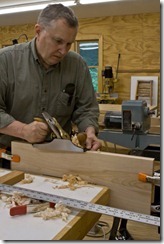 The picture at left shows how the tail cuts are made using a dovetail saw. 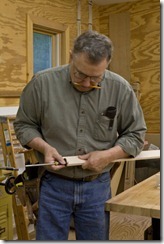 I prefer a western style dovetail saw with a rigid back. 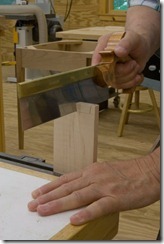 I have tried Japanese Dozuki Saws and like how easily they start, and how quickly they cut. But I just feel more in control with a Lie-Nielsen 15 ppi Dovetail Saw. 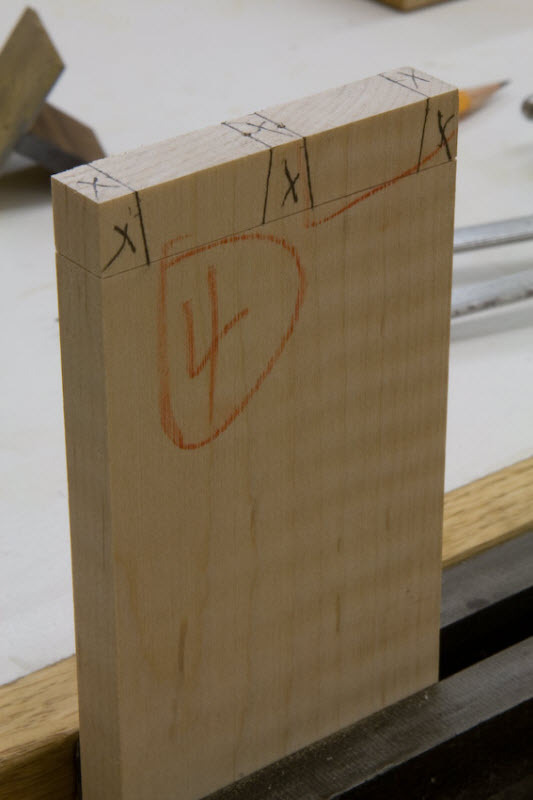 The most important parts of this cut is to cut exactly perpendicular to the face of the board and to stop at the horizontal marking gauge line. Try to follow the vertical line exactly, but if you don’t it is not a real problem; these tails will be used as a mask and copied onto the pin board, hence the error will be self correcting. I use a fret saw to remove the majority of the waste. I cut as close to the horizontal line as I dear making sure to leave enough material so that the marking gauge line can guide my chisel. This is where the Xs marking the waste comes in. If you have lots of tails, as you would in say a six board chest, it is awfully easy to be cutting along and inadvertently cut a tail off. That ruins the whole piece. 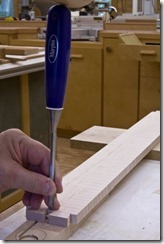 Next I use a sharp chisel to clean up the waste, shown left. This can be a tedious step if you have a lot of tails, but in this case there is only one clean up per end. 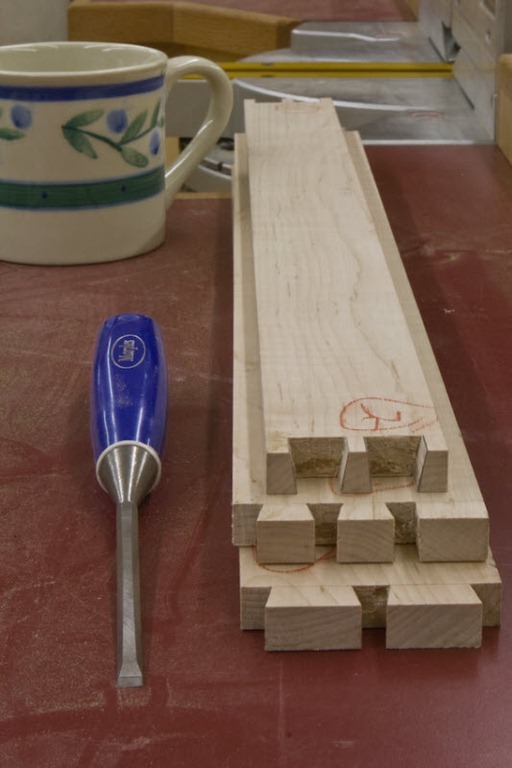 This task is made much easier if your chisel is very sharp. I like to sharpen mine just prior to use and several time through a project if I have a lot of work. The sharpening is easy and quick. It also affords you a break from chiseling. When the tails are complete on both ends of each side I use them as a mask to mark the pins on the front and back. I then use a similar process to craft the pins. Completed tails and pins can be seen at right. Note the pencil lines on the edges of the pins on the top board. Since the tails were used as a mask I cut the pins such that I just leave the pencil lines. This will assure a snug fit. Also note how perpendicular the tail ends are to the face. This is very important. Perhaps one of the most important tools in the shop is the coffee cup, full of hot coffee, shown above right. 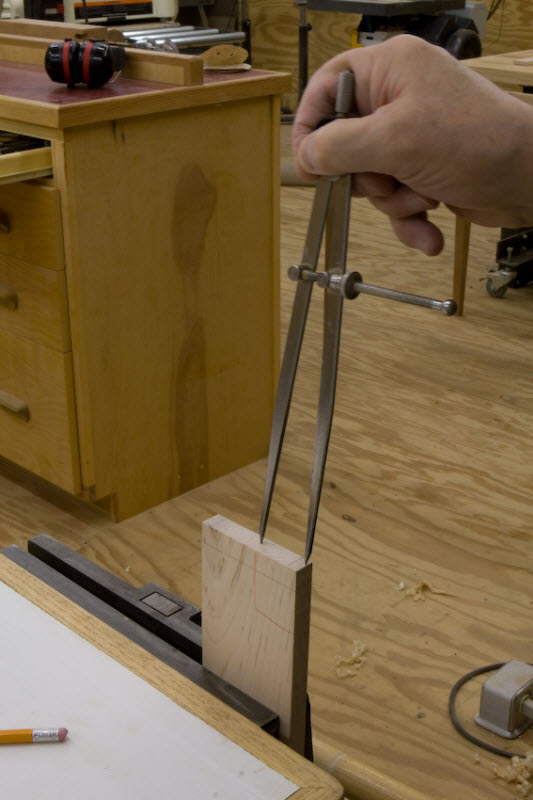 This tool is essential when hand cutting dovetails. It calms the nerves and steadies the hand. I use whole bean Eight O’clock coffee and grind it fresh. 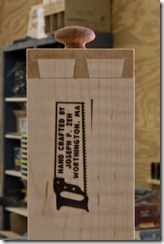 The most difficult of dovetails is the half blind dovetail – the socket that is. The tails are used as a mask. 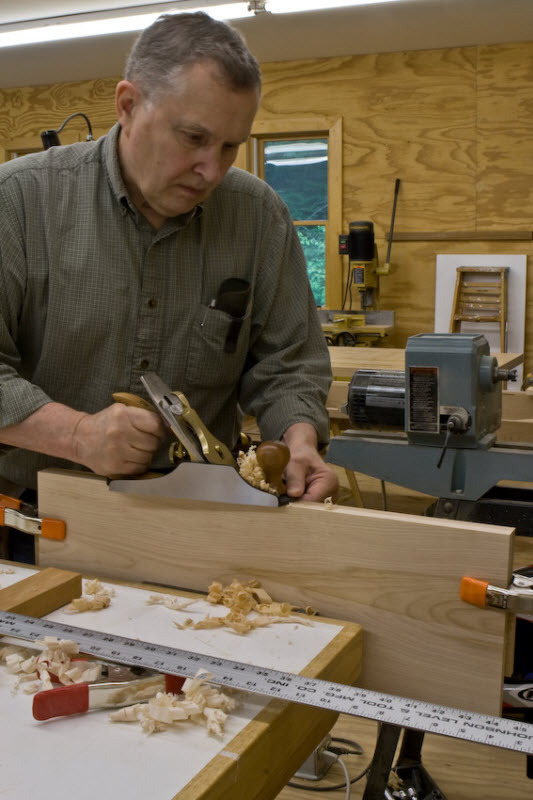 The dovetail saw is used to cut the side of the socket, which is a compound cut because you must hold the saw forty-five degrees to the end and eight degrees to the sides. This provides only a partial cut of the socket side. The rest is done with the chisel. The completed half blind dovetail is shown above right. Notice you can still see the marking gauge scribe lines. 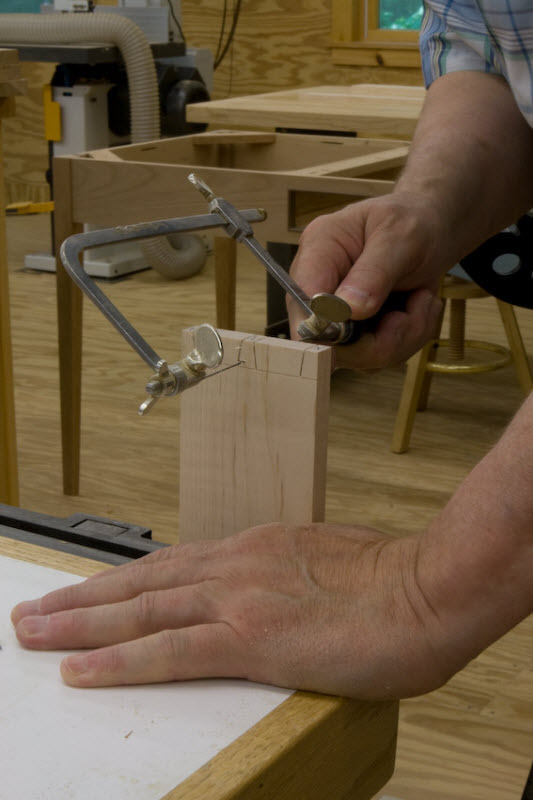 Most cabinetmakers leave these lines as a signature of hand dovetails. The completed pins can be seen in the picture at left. Notice that the pencil marks can still be seen on the edge of the pins. Leaving these lines provided a nice snug fit. Not so tight as to cause splitting and not so loose as to leave gaps. 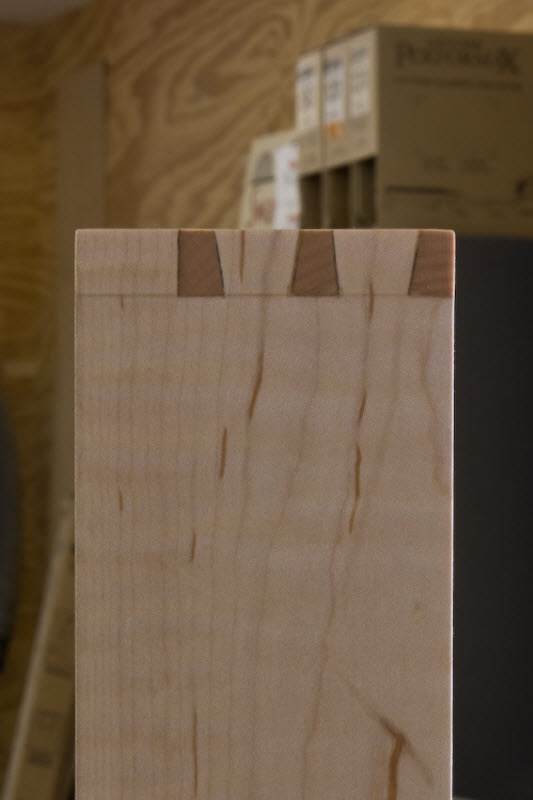 Finally, a view of the finished through dovetails, including the beveled and notched bottom is shown in the picture at right. 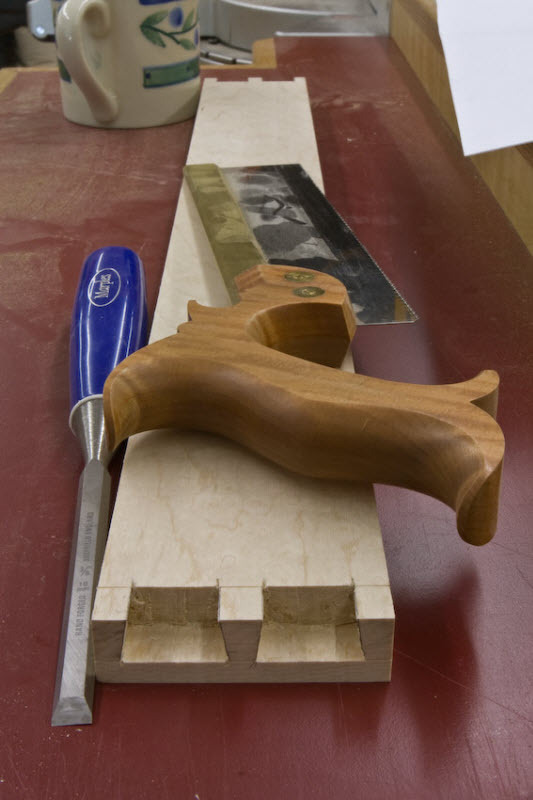 In this picture you can see how the beveled bottom rests in the dado and touches at only one point all along its edge, decreasing friction and binding so that the bottom can expand and contract freely. In fact you can see that the bottom has already expanded somewhat in the recent humid hot weather. Also shown in the picture at right above is a notch in the center of the beveled bottom. After the final finish has been applied and dried I will drive a screw and flat washer through the grove and into the back, tightening it just enough to support the wide bottom, but not so tight as to impede expansion and contraction. 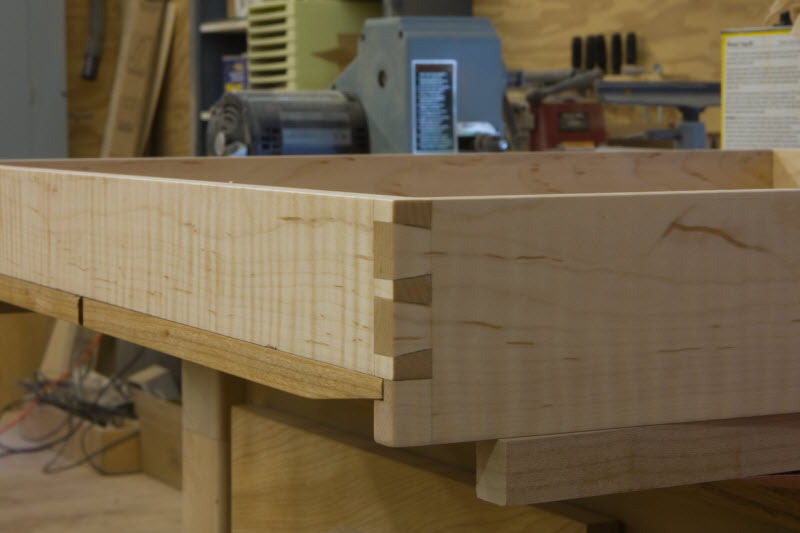 This completes the crafting of a traditional drawer. In a future article I will describe in more detail hand cutting through and half blind dovetails. Stay tuned.